When I was in my second year of university this korean restaurant opened. I was absolutely delighted. Korean food was something you had to get out to Toronto to have for the longest time before that. 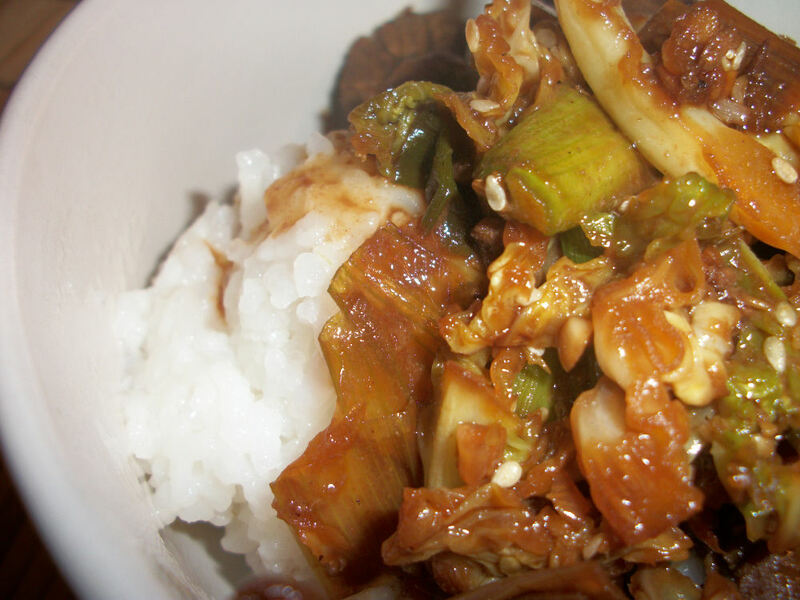 My mom’s favourite dish is the ever popular Bi Bim Bop but for me I have to say it’s the bulgogi. I’m still amused by the childhood memory of my mom talking about getting some bim bop and seriously thinking she had made up such a fun sounding dish. Sure, korean food is everywhere now but it can still be pretty high in fat and calories. You shouldn’t have to give up healthy food just to have those fun korean dishes. Ofcourse, I’m in no way traditional this is just my attempt. Combine the rice wine vinegar, soy sauce, honey, garlic and pepper in a large bowl. Add the beef strips, stir until well coated. Allow to marinate atleast 4 hours, overnight is best. Heat a wok or frying pan to medium. Add cabbage and 2 tbl of water. Stir fry until soft, usually just a few minutes. Heat the pan to medium high. Spray the pan, remove the meat from it’s marinade and add to the wok. Don’t cook in the sauce just yet or the meat won’t have the greatest consistency. Stir fry for 4-5 minutes. Add the sauce, cabbage, and onions. Cook for 2 more minutes. Sprinkle with toasted sesame seeds. Doesn’t take much to get your bulgogi on does it? Serves 4. Each serving contains 242 calories, 7.3 grams of fat, and 3.6 grams of fibre. This is great served on rice. Like your bulgogi a bit hotter? I highly recommend adding some of that chili garlic sauce to your marinade at the beginning. You know, the one with the rooster on it. Num!! 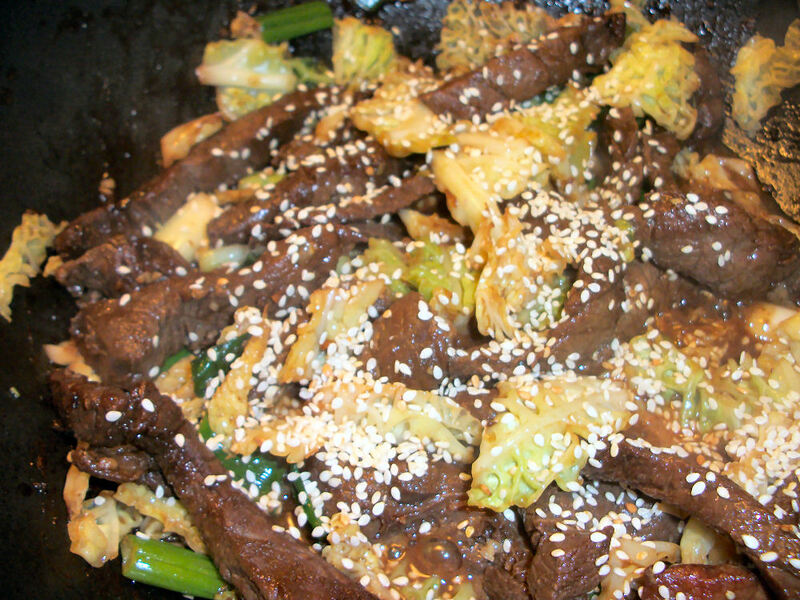 This entry was posted in Comfort Foods, Dinner and tagged Beef, Cabbage, Garlic, Honey, Onion. Bookmark the permalink.